They are believed to dwell in the realm of Arvandor on the plane of Arborea. This leaves my best current guess is that Ao sundered the entire World Tree/"Ao's Astral Plane" model, moving the deities back to being solely on the Great Wheel, as they were in the pre-Time of Troubles era. This might also help explain why "dead" deities came back: Myrkul may have always been alive on the Great Wheel, but unable to access Ao's Astral Plane and Toril. The reference to Dwarfhome in the SCAG is before the Sundering, so it doesn't affect this. Of course, other explanations are also possible. It's possible we're just back to the dual Great Wheel/World Tree model of 3e, and the elven gods' home on both Arvandor and Arborea is a reflection of that dual model. However, with FR seemingly very close to being "core 5th edition D&D", and "core 5th edition D&D" embracing the Great Wheel wholeheartedly in the PHB and DMG, I'm inclined to guess that the World Tree model won't be referenced again. The Abyss is certainly in the Great Wheel in the core 5e model, so I'm betting the same being true in the Realms. This is entirely plausible, especially if everything has been "restored" to what it used to be. This could mean either the Great Tree or Wheel, but based on what you pointed out (I don't have the 5e PHB or DMG, though now I may have to get at least one of them), it seems likely. On the "people believe" that's always been common in the realms. Its the uncertain narrator concept and it allows folks to put out feelers for an idea without having to solidly commit that what they have is indeed the best idea for the setting. A lot of times, as you'll see in these forums, this allows people to take something that conflicts with some other lore, combine the two with another spin, and ultimately make both MOSTLY true. I think you overcomplicate it. For me there is Great Wheel cosmology and World Tree is just a roadmap for Torilan planewalkers to their favored destination. As main way to get into the planes from Prime is magic, you have to know where you are going else you may end up anywhere on the target plane. So they are not shifting to Arborea they are going to Arvandor and that is where they end with this knowledge (and successful spell). I have even got further and asked myself - what setting do I want to play in? And answer was Forgotten Realms not Darksun not Dragonlance not Grayhawk so I have changed Spelljamming to a way of travel in Astral sea (as Githyanki do). This way I do not have to think about Overpowers, multispheric dieties,... For me Mulhorandi/Untheric slaves came from Zakhara as did their dieties (Imaskari did just a big version of Dimensional Anchor over their domain). As for the inner planes the six of them are formed around a place of elemental chaos and they are kind of barrier that also gathers their element from it. On their borders are quasi and para elemental (planes) made by mixing of bordering planes. Beyond them is Ethereal plane that is formed from protomatter created by inner planes. On the next border is Material plane and you can say those inner planes are "inside it" to form an idea about neigbouring forces. On the "outside" Shadow plane, after that Astral sea full of nothigness and then Outer planes - realms of souls, morality and gods who rule there. Another heresy of mine is that Toril is not a planet but a plane and it is aligned with both inner and outer planes. On its borders it merges back to inner planes, deep under is Negative plane and up above is Positive plane - the source of Light. Moon is just a manifestation of Selune with her allies (stars) in the neverending battle with Shar (darkness). Sun is a manifestation of current sun-god (Lathander) and Dawn heralds (stars) are signaling the phases of the Sun. True, but there are certain things that have remained (to a point) consistent, until 5e. I haven't seen the "people believe" nearly as often in previous editions in regards to the gods. Yes, I completely understand vagueness or belief on certain things, as mortals aren't going to know everything, and it does allow room for people to come up with their own explanation, but certain things weren't phrased with "people believe" before. It was just stated as fact, and that was something I liked. Take the above excerpt, for example: "They are believed to dwell in the realm of Arvandor on the plane of Arborea." Before, it would have been more common to see it written like this: "They dwell in the realm of Arvandor on the plane of Arborea." I'm probably in the minority here, but it was something that didn't sit well with me. I realize in the grand scheme of things, it's a minor detail, since by and large, the gods are still a part of the Realms, and the existence of the gods and planes are still fact, it's just the details are lacking. Perhaps that's why they used the word "believe"? In previous editions, there was a lot more detail (that's why we're able to have this conversation about the cosmology at all, though of course certain details about the planes are left up to interpretation, as we are doing now), and maybe this is just their way of simplifying it to allow DMs more wiggle room (though people have been creating homebrew worlds throughout all the editions). Idk, it's just something that irked me, personally, but again, it's probably a minor detail. Back to the main discussion lol. Sorry for the big font. I notice posts do that sometimes. I tried changing it, but it still appeared like that. By the way, on the idea of separate astrals/World Tree Model versus the single astral/Great Wheel model (which read the below... the main difference is that in TORIL ONLY during 3.5 you could theoretically could NOT jump directly from one outer plane to another without going to the prime first). Each astral therefore did NOT have a connection directly to the other astrals. So, in essence, dweomerheart had its own astral plane, and every other special domain for Toril did as well (now, I'm fairly certain if I start looking, I'll find in 3.5 lore something that breaks this rule, but not going there). I'm assuming this became the model as a result of Vecna doing some plane spanning effect at the end of 2e or somesuch. However, just to play with that idea for a bit. What if Abeir had its own astral and it was in it (that's the steelsky). What if said astral had connectivity to its own finite sections of the elemental chaos and that's it. Then, the Toril/Dweomerheart astral shrivels its connection on the Toril side and instead connects to the Astral of Abeir/Abeir's elemental chaos... and in so doing for a short bit Abeir's elemental chaos leaks into the elemental planes of Toril, surrounding them and connecting them much like in Markustay's example above... and revealing the connection between the elemental chaos and the chaos of the Abyss... and suddenly there were direct connections from some layers of the Abyss to Abeir (which we know exist due to the Brimstone Angels stories). If this same shift happened with the astrals related to domains for some other pantheons (say like the Mulhorandi one) OR for maybe some domains that were sitting out there currently disconnected from Toril because their deity was dead).... hmmm, dead deities float in those astrals.... when the shift happened, might there have been some kind of big magic flux come through that could have awakened a bunch of dead deities? "At the center of the universe lie the twin worlds of Abeir and Toril, slightly out of phase with each other. Both revolve around the same sun and both have a large lunar satellite, Selune, trailed a line of moonlets known as the Tears of Selune. "Toril lies at the center of multiple planes. Two of those planes--the Feywild and the Shadowfell--form reflections of Toril...Beneath Toril lies the churning substance and energy of the Elemental Chaos, which holds numerous realms within its reaches. Below the Elemental Chaos id the Abyss, home to demons. Above Toril lies a silvery void known as the Astral Sea, in which stars part to reveal dominions--homes of the gods. It should be noted that during 3e that FR resources did reference multiple astrals that weren't necessarily linked. My viewpoint is that all planes are in fact finite (despite what we're told), but that its these links that "grow" between the planes that make them seem endless. So, for instance, there's a Seven Heavens for Toril, a Seven Heavens for Greyhawk, etc.. and you can walk from one to the other via an extended "pathway" that connects them such that you don't realize that you're going from one to another. Thus, you could "blow up" the Seven Heavens of Toril and it in effect just severs those links to the OTHER Seven Heavens that exist. In fact, some of these links may shrivel up and die, such that something that used to be called the Seven Heavens and was connected to the others no longer has a connection to the others and they may then decide to rename the original by calling it say "Celestia". Similarly, one plane may bud off of itself and create a new plane with a connection to the old and then shrivel the link between them. In this model there is somewhat of a problem with multi-spheric deities, but not a huge one. Essentially, each deity would have to build a "clone"/"manifestation"/"greater avatar" of itself that is separate. I suspect there is some kind of "dimension" or "frequency" where all of these separate godly personalities exist as one or as some kind of council, and that some effects are able to access this dimension and thereby affect gods across pantheons/crystal spheres/etc..., but that doing so can be much more complex than affecting an individual "god node". This handles the issues where sometimes something affects a god and its only local, but other times a god is affected and it goes across the planes. If you were to compare this to networking, it would be as though this were a multi-cast (not broadcast) transmission, and anything subscribing to that multi-cast would accept the input. It may be that over time some "manifestations" quit subscribing to that multi-cast transmission, and thus they sever themselves from the other "manifestations" of that god in that collective. In this way, there may actually be multiple and different versions of say Tiamat, some of which have lost track of each other. Then again, whenever two versions of the same being find one another but one is no longer listening to the multi-cast transmission, they may be able to rejoin the conversation with the aid of the other. I've posited that the infinite planes may not, in fact, be infinite... Instead, my thinking is that each plane slowly tapers off and gradually fades into the next. It's kinda like how geographical features are shown on a map. On a map, the plains continue right up until a full-on set of mountains springs up. On the other side of those mountains, it's suddenly flat again. But in reality, you have miles of flat, level plains, slowly and gradually becoming less flat with gently rolling hills. And then larger hills. And then still larger. And eventually, those hills are mountains. You can't pinpoint any one spot where the ground went from smooth and grassy to rough and rocky, because it's a gradual change. And I think the planes could be the same way. In the "central" area, where all the divine domains and towns are, the plane will be solidly one alignment and set of planar features. LG, for example. As you get further and further from that central area, the LG-dominance becomes less and less, and NG starts creeping in... After a while, you're solidly in NG, with LG nowhere in sight. So the plane does not have a boundary, making it -- technically -- infinite. But sooner or later, you've left that plain and moved to the next, without even noticing. Anyway, that's a theory of mine. Not sure if I think it's truly the way things are, but it's something that crossed my mind as a possibility. I'm not a fan of multiple versions of the same plane, save for the Prime itself -- and that's because lore does refer to alternate Primes and because the rules are different for different campaign settings. Therefore, I theorize that all the other planes of Planescape are unique, but there are infinite Primes that touch most of them. Or perhaps there's only one Prime, but it has infinite layers -- and each of the campaign settings is its own layer. Thanks. I've updated the wiki. On what Wooly said - I'm not a fan of multiple planes with the same name, either, which is why I came up with my 'neighborhoods' theory awhile back: Different worlds connect to different parts of planes, and in a (nigh) infinite plane, they may as well be separate planes. in other words, suppose the Astral was just as large as the universe. Each solar system (Crystal Spheres in D&D) would have their own 'neighborhood' corresponding to its location in the astral. In order for someone to walk from Toril's astral (neighborhood) to Krynn's Astral (neighborhood), you'd have to walk the same distance as if you were walking from one solar system to another. in other words... FORGET ABOUT IT! They may as well be 'separate planes'. Buuuuuut, if you use some sort of 'Planesjamming' technology - a ship that can sail the astral seas - you could get there WAY quicker, like with SJ. And there may be some sort of mitigating factors that would hamper this as well - 'denizens of the void', and what not. As for whether the planes are infinite or not - I ascribe to much the same theory, but I think a lot of them - like how the 'Gate Towns' work in the Outlands - those are actual gates, that are too large for people to realize they are not actually traveling physically from one plane to another (and it may even be gradual - the 'gate' itself could be passing through an intermediary plane - a transitive plane - so its not 'instantaneous' - that would simulate the effect you are talking about, Wooly). @CorellonsDevout - thats some intriguing bits you came across there. So there STILL IS a second moon for Abeir-Toril? I'm also thinking the 'silver sky' in Abeir is actually the Astral - it just makes so much sense. I think thats where the copy-Toril is being 'stored'. Maybe the astral is like the 'basement' of the universe? Or the 'attic'? (the Shadowfell/Chaos might make for a better 'basement') Gods just shove 'their stuff' in there to store it... and in most cases probably never look at it again. maybe if we travel to the astral, we can find an old trunk with pictures of Ao as a baby? [b]Markustay:[/i] I am not sure if the statement "both have a large lunar satellite" means they have a separate moon, or share a moon like they do the sun. And the "silvery sky" likely is the Astral, considering it is a "silvery void". I also noticed that the Elemental Chaos was stated as being *below* the Abyss. I think once again, its all matter of perception (preconceptions/dogma). Torillians find it 'easier' to access the Abyss, hence, they picture it 'closer', with the Elemental Chaos 'beyond'. For people from most other worlds (like GH), accessing the elemental Chaos is easier, hence their belief its 'closer'. In an immaterial multiverse, everything is as far away as you think it is. The only things that are 'set in stone' are those things in the prime material, which is what makes The Prime so special - its an immutable anchor. 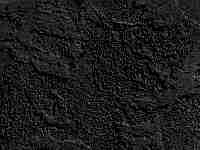 My latest (DARK) theory is that the Prime Material is just the dead body of GOD. Hence, its importance. I've been using the theory that its the body of Ymir, but since I think all the Sidereals are just aspects (concepts) within the 'mind of GOD', that would make that 'piece' (aspect) more important for some reason. Perhaps that is the only place non-claimed (by Gods) 'soul stuff' can be found? Maybe losing that piece (died during the Godwar?) is what fragmented GOD (the world serpent) from the very beginning? Some pieces (gods, etc) are working hard on putting it all back together, while others are trying very hard to continue its dissolution (entropy). Chaos (Cthon? Tharizdun?) wants it to continue the decay, because then the universe reverts back to its primal (unregulated) state. Its pretty dark - probably the darkest version of the cosmology I've yet to come up with. It gives all sides a 'desperation' that we don't usually see, not even in the canon PS material. It also leaves us mortals as just a necessary 'cog in the wheels', nothing more. And yet, infinitely important. Oops, sorry, typo on my part. So I wrote all that over a typo? LMAO! Haha no. In my original post (the one with the quote from the PG) I wrote it correctly. The typo was in my later response. I've theorized that, as well, though I didn't present it, this time around. Well shitake mushrooms. I searched and searched looking for whether the steelsky had a sun and moon. Thank you for finding this, but damn if it doesn't put a clinker in some of my ideas that I was writing up for what happened in Abeir. I read the stuff about "not jumping between branches" too. The only way to get between planes besides going via the Prime was either climbing the "World Tree" (the same term as they used for the overall cosmology, but describing an actual climbable cosmic tree) linking the "celestial" domains, and a "River of Blood" linking the "fiendish" domains. It implies that the Faerunian pantheon's Astral Plane was not able to be travelled. The cosmological world tree model itself was not so much a physical tree but a way to model connections to the Prime. This fits in fine with the combined theory though. In this theory, the only connections to Toril's Prime are through the 3e planes (Dwarfhome etc, and also the unspoken Zakharan etc planes). Dwarfhome itself then connects to the Great Wheel, allowing Moradin's realm to exist on both Dwarfhome and Mount Celestia. It's just important to note that you can't just sail around on Faerun's Astral Sea to get to the other planes. It is interesting about the different continents getting their own separate Astral areas. Complicates the picture a bit further. I didn't think each individual plane had its own Astral though? I'm imagining Ao creating the separate Astrals for Toril post the Time of Troubles, rather than at the start of 3e where we learned of them (possibly as mortals were learning of them in the Realms). Then they stayed this way throughout the "Era of Upheaval", which ended with the Sundering by Ao getting rid of the separate Astrals and returning the deities' domains to being solely on the Great Wheel. The "dead" deities had been on the Wheel all along, so they were able to return. This also helps explain why the deities "feel farther away" (at least for a time) post-Sundering. Problem being that during the 2e era was Planescape, and we have lore of Sigil and Planescape. I would be tempted to say it was after the ToT too, but that may throw in too many clinkers than to just say "there was suddenly a change, forced by outside of Toril". I would agree that the separate astrals going away probably happened due to the spellplague though. Abeir is still supposed to be separate though. Man, my heads starting to hurt trying to think in all these dimensions. Oh, and on the separate astrals and outer planes, somewhere in PGtF, it also states that the abyss, blood rift, and nine hells are connected to the same astral, such that you could go from one to the other without going to the prime first (to enable their constant warring). In and of itself, that does sound like the abyss got disconnected from that particular astral and somehow connected more strongly to the Primordial chaos (which it may have already have had a connection to). It does NOT say they are visible, merely 'present'. I still think Abeir is in the Astral (overlapping Toril), which means it is occupying the same physical space, but in another dimension. Since it IS in the same space (basically an 'astral projection' of Toril itself), it revolves around the same unseen sun and moon. Just as with a shadow, or a reflection in a mirror, whatever Toril does, Abeir also does. I'm not really a fan of the new planer layout, but I was 100% on board with either of the last two (three?). I like some of its concepts - and some of them even mirror some of my homebrewed stuff - but not how they arranged everything. 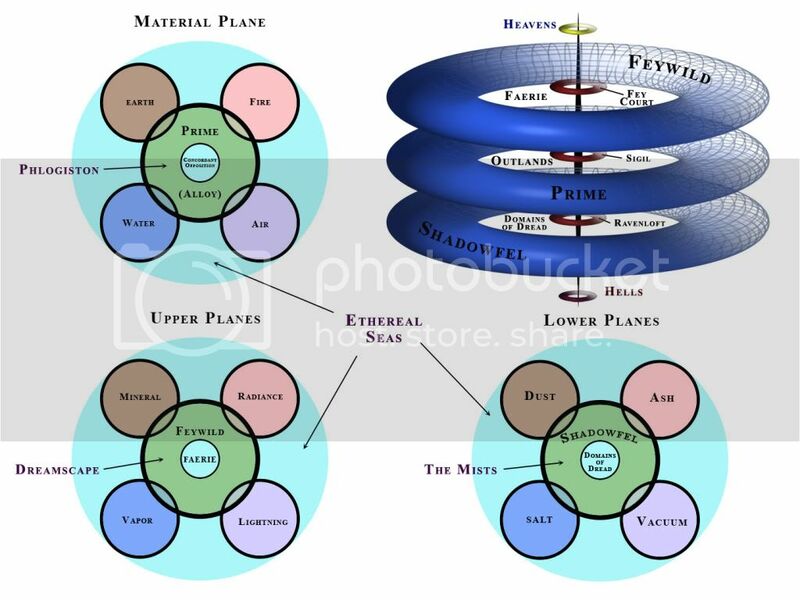 The whole shebang is very similar to the 'platters' model I did a few years back, but I have the plane of Shadow beneath the Prime material, and above the 'hells' (lower planes), and I have the Feywild above the Prime and below the 'heavens' (upper planes). Thus, the Shadofell becomes the actual shadow of the world (Prime Material) cast upon the hells, and the Feywild is the reflection of the world in the 'shiny underside' of the heavens. It was actual a stack of torus', not platters (my 'platters' idea spawned the latter torus model. I've been meaning to tweak that, given all the new info. My faorite part is putting the Outlands in the center of the prime Material - I feel it makes much more sense that way (so the actual 'hub' of the Great Wheel sits at the center of everything). The Gate-Towns are still there, but they are just 'Gates', which I've always gone with. The Torus that is the Prime Material Plane contains all the Crystal Spheres (settings/worlds) floating in the phlogiston. The upper and lower planes are actually at the furthest points from it (but the endless spire pierces it all). In that model, the elemental planes are still pristine and distinct. If I were to re-draw this, I would have it where the elemental 'bubbles' were broken and leaking into the Ethereal (so THAT is what happened to the ethereal - it became contaminated by the elements and is now the 'cosmic soup' - the Elemental Chaos). The astral sits on the outside of everything (and is connected to everything). Then the entire things sits in an uber-mega-Crystal Sphere (each universe in the multiverse does). The bubble itself is super-thin, Fuligen (the color darker than black - the color of 'emptiness'), impenetrable, and is the Realm of Erebus - the only thing that stands between reality and the insanity that is The Far Realms on the other side (the state of the universe before the D&D universe was 'born' from it). Erebus may be the one being completely immune to Cthon's dark whispers from the void (because Erebus is the living embodiment of 'the dark'). And in my cosmology, Erebus is also the father of Shar. Shar is not true darkness - she is merely those places where the light cannot shine. She is shadow, and she was born of both the light and the darkness. Nyx gave birth to Aether and Day (Hemera). There is some kind of parallel there with Shar, Sel�ne, and Mystryl. This is again from the wiki page (I typed in Astral Plane), so you all may have seen it, and I don�t know how accurate it is, but I wanted to see what it said. I haven�t used the wiki page this much in a while lol. I prefer looking at the sourcebooks, but here it is. Color pools still existed in this model, but an Astral traveler had to choose the destination plane before setting out and would only encounter pools that lead to the chosen plane. To change destinations, the traveler had to reenter the Material plane and then begin the journey anew. Toril's Material plane actually linked to several other Astral planes, each of which connected Toril to the outer-planer homes of a different set of deities. They are based on the geographical areas of control held by the different pantheons. As such, there is an astral plane for the Maztican and Zakharan pantheons (even though many of the Zakharan deities may reside on the Material Plane). The Kara-Turan faiths are not connected to their own astral plane, as instead their deities connect to the Spirit World. Very little is known in Faer�n about these other astral planes but it is theorized that Ao supervises them just as he adjudicates the conflicts between the pantheons. "In Abeir, the sky�s pleasant blue is long forgotten. Instead, a metallic-hued vault arches from horizon to horizon. When violent weather approaches, the steelsky boils into dark green and copper-hued clouds. Steelsky doesn�t obscure sunlight, moonlight, or the stars. The metallic sky is due to arambar, the residual energy of an ancient primordial. Arambar was a Dawn Titan whose power was so vast that even in death, its memory visibly persists across Returned Abeir." The arambar have other qualities as well. It you inhales it, you can see the future and that stuff. Ahh, that's unfortunate. I was kind of hoping there wasn't any reference to people going direct to Sigil or the Great Wheel in 2e FR sources, and that we could write off references to them in 2e FR as being the current understanding based on past experiences. Oh well, easy to say it just took Ao 14 years or so post Time of Troubles to make the decision. I don't think the separate pantheonic planes (eg. Faerun vs Zakhara) would have been combined post-Spellplague, because we don't see any reference to the deities of those other areas in the 4e material: all the 4e planes are made up of the deities that were in the "Faerunian Astral". I do agree that the "world tree" cosmological model was likely broken by the Spellplague, emptying the 3e planes out into the Faerunian Astral and making it traversable - at least until the Sundering. I don't personally get each of the 3e planes having its own Astral, but whatever works! I kind of just like the symbology of them falling off (out of) the World Tree into the Astral Sea. As an aside, I imagine the reason why you can't "jump" between branches/planes in the World Tree model is that the planes are contained within the tree, rather than on it. AFAIK, the last novel of the Empyrean Odyssey trilogy states that World Tree was destroyed by the Spellplague. So, at least in 4e, the Tree did not existed anymore. Dunno if Ao resurrected it during the Sundering.